Mirka Mora, was one of Melbourne's best-known and most-loved artists. 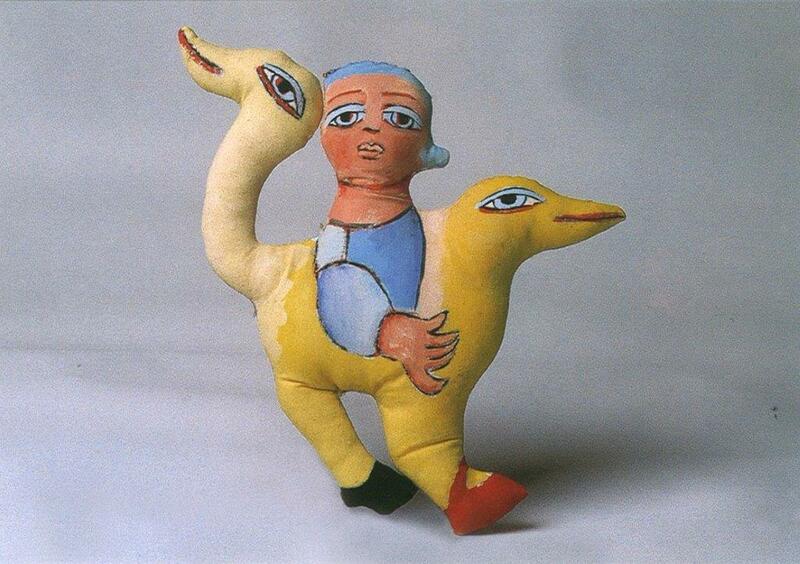 Caption: Mirka Mora Doll 1979. Cotton fabric, plaka poster paint. Purchased with the assistance of the Crafts Board of the Australia Council for the Arts, 1980. Ararat Regional Art Gallery Collection. Her distinctive works adorn many Melbourne walls and landmarks as murals and mosaics. In a career spanning more than six decades, Mora's works included painting, ceramics and even doll-making. Mirka's son, William Mora last week made the sad announcement. "It's with great sadness that the Mora family announces the passing of our matriarch, the magic Mirka Mora,” he said. “An artist and mentor who touched the lives of thousands, she has had an indelible effect on Australia's cultural life. “At 90, she fought Alzheimer's and age-related illness to the end. The joie de vivre she has shared with so many will continue in her immense legacy of art and her spirit of generosity.". Ararat Gallery has had a long and affectionate association with Mirka Mora. She visited the gallery on several occasions for exhibition openings and events that included her artworks and her work is represented in the Ararat Gallery’s permanent collection. She had more than 35 solo exhibitions throughout her career, including three at Ararat Gallery. On October 6, 1978 the gallery presented: ‘Mirka Mora - Embroideries’ and ‘Mirka Mora - Dolls’. Mora attended and spoke at the opening of these exhibitions. In 1980 Ararat Gallery acquired one of her ‘Dolls’ for the permanent collection (pictured). Her distinctive dolls became a significant element in of her body of work and she even presented a doll making workshop at Ararat High School during the 1978 exhibition. “I began work on my dolls eight years ago. It started from a technique used long ago by the Old Masters. “To help them with the shadows in their paintings, they used to make plaster models of figures in order to study contours and tones of light and dark. I needed this added dimension to help my painting, so I adopted the technique of cutting out drawings. This eventually led to dollmaking. “First, I drew different images on a sketch pad, until one says to me, ‘I want to be a doll’. I practice drawing the figure until I’m ready to paint an outline onto fabric, whether a soft lawn or heavier canvas. My dressmaking experience comes in handy when I want to sew the doll up on a machine. Ararat Gallery also presented her in 1999-2000 in a touring retrospective exhibition curated at Heide Museum of Art called Where Angels Fear to Tread celebrating 50 years of her work. Heide will mark her 90th year with Mirka Mora: Pas de Deux - Drawings and Dolls, opening in October. Mora was made Officier de l'Ordre des Arts et des Lettres by the French government in 2002. She wrote several books, including 2000's My Life - Wicked But Virtuous. In recent years she become a favourite on ABC TV's Agony Aunts, sharing her philosophies on life, love and family, often with a good deal of sass and cheek. “It is gruesome,” she said. But not even death would curtail her art, she tipped.